So you think it’s time to put a face with your brand? If so, then you’ve come to the right place! The DBP Branding Experience has a collection to fit all needs. From the person that just needs a few quick headshots to update their social media profiles to a business refresh looking for something a bit more in depth to a complete brand overhaul giving you images to last throughout the entire year, there’s a collection suited for everyone. The DBP Branding Experience is a one stop shop where you can take the pressure off of yourself and allow me to help you create a brand that’s visually interesting and sets you apart from your competition. 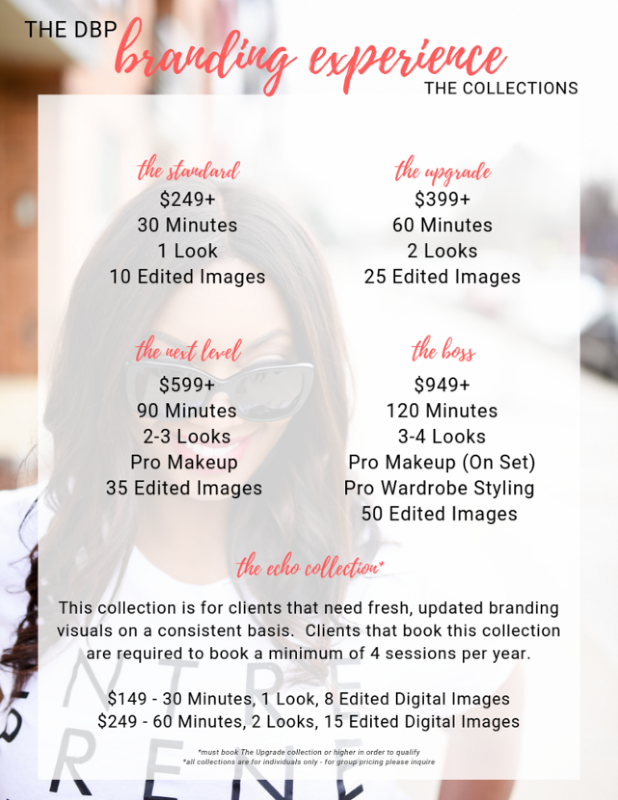 Take a look at the collections offered below and once you’re ready to book make sure to send me an email so that we can begin bringing your vision to life. For more information about each collection or for booking please email me.